BLACK Friday for many is a chance to bag the perfect Christmas present for a bargain price. But for scores of emotional Royal Navy families in Portsmouth, it was a chance to celebrate a gift that’s impossible to put a price on – the safe return of their loved ones. 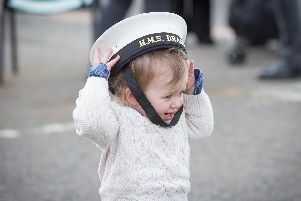 A sailor and his daughter during the homecoming of HMS Diamond. Hundreds of people lined the jetty at Portsmouth Naval Base to welcome HMS Diamond home after her latest deployment to the Mediterranean. The £1bn destroyer had been part of a Nato operation tasked with battling Islamic State terrorists in Syria. Although the state-of-the-art warship may not have fired a round in anger during her brief stint at sea, she played a critical role in using her hi-tech array of sensors to keep the skies safe above the force. And to mark her safe journey back home, Diamond’s captain, Commander Ben Keith fired a 17-gun salute from the Type 45 before she sailed into the city. Pictured here are a family reunited upon the return of HMS Diamond to Portsmouth. Petty Officer Craig Furber is a communications and information systems specialist on Diamond and was among the first off the ship. He said his family had been rattled by the deployment, which was sprung on them with very little time to prepare – causing him to miss his mother, Dawn Gray’s wedding. The 30-year-old – who was greeted by his wife Elizabeth, 31, two-year-old son Adam and the rest of his family – said: ‘It’s been emotional because of the short notice of it. Dawn, who lives in Gosport, added: ‘It was devastating for him not to be there. His brother is in the navy too and was able to make the wedding. Phil (left) and Wendy (right) Brooks, awaiting the return of their son from his time away on HMS Diamond. And she tackled demanding training with the RAF, who used fighter jets to simulate mock air assaults. AB Joe Hobday, 24, is a Portsmouth lad born and bred and was thrilled to be returning to his home city on board the £1bn destroyer. He said: ‘It’s absolutely amazing seeing all your friends and family on the jetty – and coming back to my home port of Portsmouth. Natasha Hobson, 36, was with her two children John, seven, and Albie, five, as they waited patiently for her husband Lieutenant John Hobson, 35, to arrive. Pictured is Owen Ellaway dressed up in naval attire awaiting the return of his father on HMS Diamond. She said: ‘I think it’s amazing what they do. They’re all really brave. It’s really hard for them going away. But it’s just as hard for the families – it never gets easier. Hannah Clark was waiting for her husband Lieutenant Commander Ollie Clark, alongside their two children Cameron, five, and William, three. She added she was incredibly proud of her husband and Diamond’s crew. Diamond is due to remain in port for maintenance work. Her next mission will see her operating in UK waters, protecting Britain’s coast. John Hobson, seven, with mum Natasha, 36, and brother Albie, five, as they hold their Welcome Home Daddy sign at Portsmouth Naval Base. Theyre waiting for dad Lt John Hobson. A sailor embraces his family after returning to Portsmouth from HMS Diamond. Hannah Clark, 37, with sons William, three (left), and Cameron, five (centre). They were waiting for Lt Cdr Ollie Clark. Pictured here are some of the senior rates of HMS Diamond waving to their families as they return to Portsmouth.